If you’ve ever used a standard compression sack, it’s kind of like changing a car tire – but instead of tightening lug nuts one at a time, you get to awkwardly yank on straps. Our compression stuff sack is better. Two generous, durable nylon handles make it easier than ever to compress your sleeping bag’s volume by 35%. 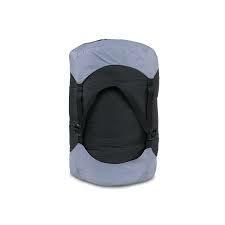 Includes two quick-release buckles for effortless access to your bag.